I made these delightful appetizers to take to a friend's for dinner. 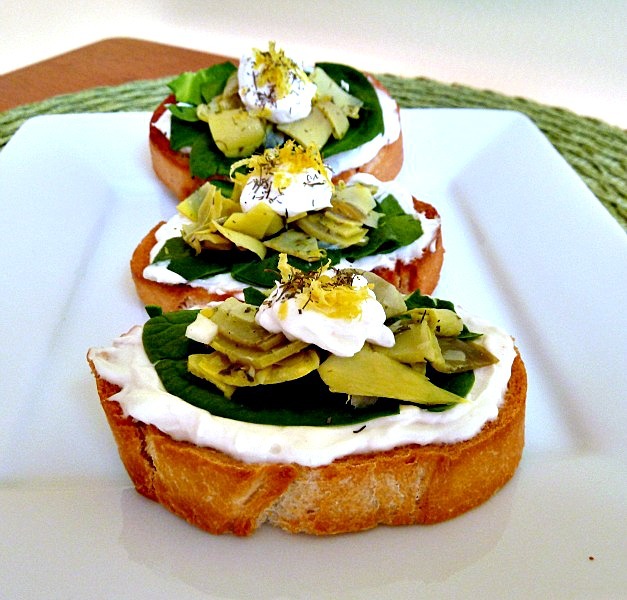 They are very good with toasted baguette, herb cream cheese or Boursin,, Baby spinach, and Baby Artichokes on top. They have all of the flavors and colors of Spring in one bite, fresh Spinach and artichokes, and lemon, with fresh herbs. If you are looking for a different appetizer for your holiday dinner, these would be perfect. They are like inside out Spinach Artichoke dip with fewer calories. I used Baby artichokes, which I cleaned and steamed and then combined with olive oil and herbs. These Baby Artichokes are so cute, but there is a certain way to clean and cook them. After rinsing the chokes, snap off the lower petals, until you reach the yellow-green core. Use a knife to cut off one-half in of the top.of the Baby Artichoke. Trim the stems and all remaining dark green areas from the base. Now you can slice, halve, or quarter, depending on what is needed for your recipes. Once the chokes are cut, soak in lemon or vinegar water to keep from browning. Here is a link to everything that you wanted to know about Baby Artichokes, Preparation of Baby Artichokes. Steaming is the preferred way of cooking, either in a steamer or in the microwave. You may also used the canned artichoke hearts or the marinated ones in a jar, if you don't have fresh ones. Combine all ingredients in small bowl and mix well. You can make this spread ahead of time for flavors to blend. Spread some soft cheese over each slice of toasted bread. Lay torn pieces of spinach over top of cheese, sort of like a jigsaw puzzle. Top with a spoonful of the marinated artichokes, a small dollop of cheese, and garnish with lemon zest and serve. These crostini look delicious. I adore artichokes and am always happy to find another recipe to use with them! Christiane-This is a wonderful recipe for artichokes and spinach, which pair together. If you try it out, let me know how you like it. What an elegant veggie app! This looks DELISH! This appetizer is so good, with the cheese, artichokes, and spinach! Crostini does seem like the healthiest think in appetizers today! I find myself turning to them instead of the greasy cheesy stuff. Your variation here does look tasty. 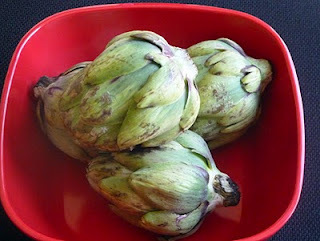 I have yet to do anything with artichokes, so this post was helpful as well as inspiring. Well done! This recipe is delicious, as well, as healthy. I used light cream cheese, which has fewer calories. glad that this info helped you. Good lord woman I am ready to dive into the screen this is fabulous! Love this one a must try no doubt will be doing this one! Happy EASTER! Happy Easter to you, too. 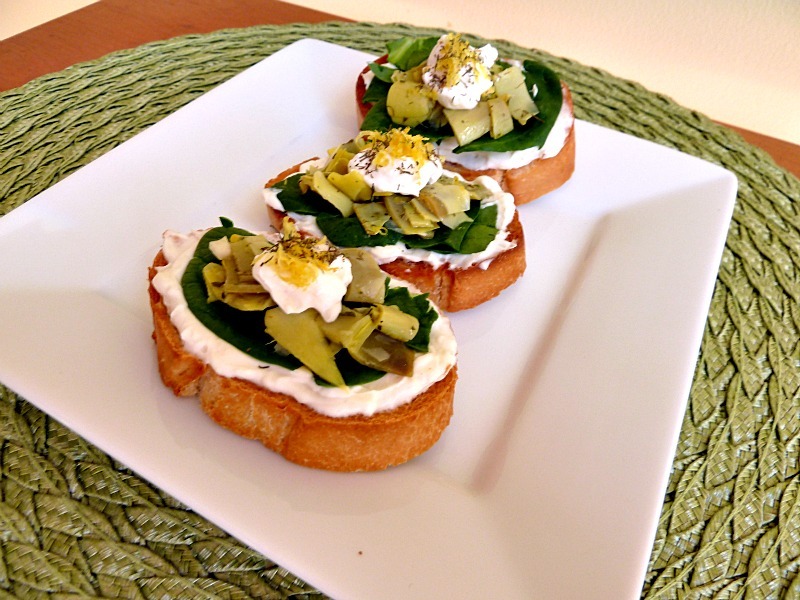 This appetizer is full of flavor, with the herbs and lemon, as well as the spinach and artichokes.